Our horse fence rail specifications are shown on the diagram to the right. The broad 120mm rail width is 15% wider than some alternative flexible rails. This provides for a “traditional timber fence” look. Narrower rails look less substantial and cheaper. It also provides high visibility to horses. 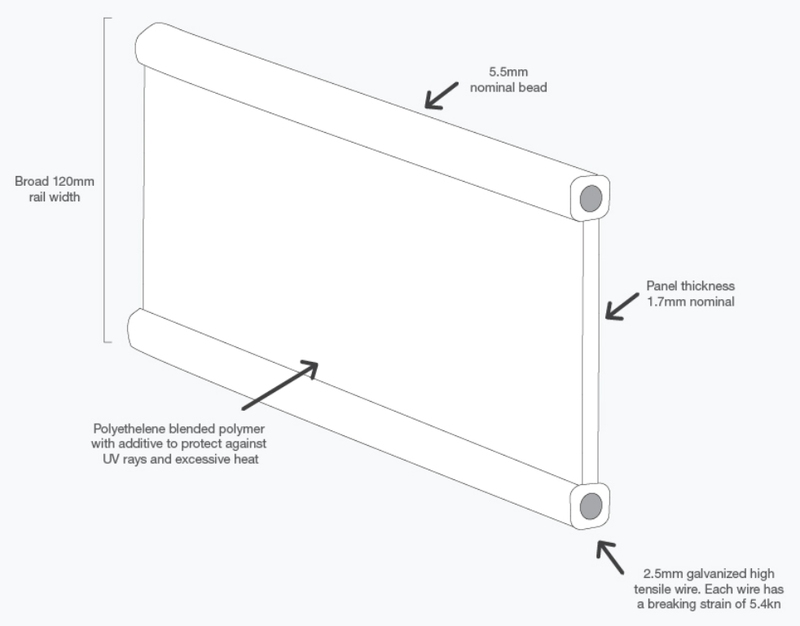 The strong polymer panel has a 1.7mm nominal thickness. The material is polyethylene. This polymer features low perosity and low surface friction making the rail easy to maintain. The highest quality additives are used to protect the rail from harsh UV and heat. The two 2.5mm high tensile wires provide for optimum strength ensuring your horses are safely contained. The wire provides reinforcement to the polymer rail and is also used to tension the rail. The high tensile strength of the wire gives additional security and a taught finish. The wire is galavanized providing for long life and weather resistance. The rail is low profile and features smooth edges.